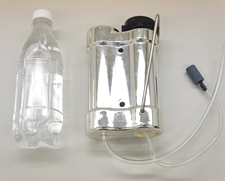 “Water Pure™ is equipped with a proprietary (0.02) micron hollow fiber membrane filter. 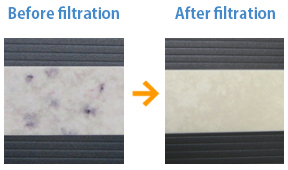 Passing water at a high pressure to the high performance filter removes all particles. Water that is not normally drinkable such as rainwater, river water, pool water, is made harmless and tasty by Water Pure™. Convenient for all emergencies. Please take this opportunity to check your disaster prevention bag at home. How many liters of water are in plastic bottles? During a disaster, the government recommends 3 liters per day. 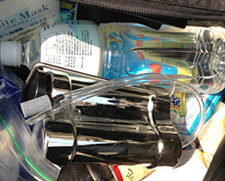 3 days = 9 liters total as a guide to prepare emergency drinking water. Can your family really survive until you can secure stable drinking water? 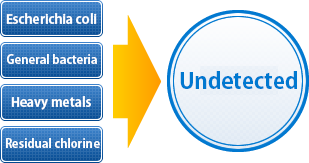 Water Pure™ has the highest water purification ability. According to survey results of a third party organization approved by the country, E. coli and general bacteria are harmful to the human body. We know that almost 100% can be removed by Water Pure™. Also, with the cooperation of external organizations, it was proven that radioactive cesium could also be removed in private experiments. Filter fresh water in fish tanks with Water Pure™. Then, inspect residual substances. We made the operation easy. Put the water you want to filter in a common PET bottle, install the Water Pure™ body → push the lever and pump water to purify. No special force is needed. So, even women and children can handle it easily. “Water Pure™ has outstanding durability. 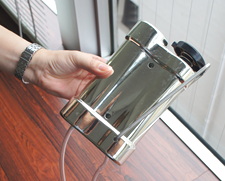 It is possible to clean 2,000 liters with one unit (when using tap water). Drinking water required for disasters is said to be 3 liters/ day per person. Q. Can any water become drinking water once impurities have been removed? A. Please do not use Water Pure™ with thick, muddy water because the filter clogs and the life becomes extremely short. Also, please do not use water that can not inhabit live creatures such as fish. Use with low transparency seawater. Q. If you filter the water containing radioactive material, where will the material go? A. It will be collected in the internal high-performance filter. But, please do not use water that may contain radioactive substances. ※The radioactive material inspection result that is posted is uniquely inspected by the inspection organization (1, NPO corporation Tohoku Help Food Radioactivity Measurement Center) (2, Okinawa Prefectural Environmental Science Center) to confirm the uniqueness of our products. 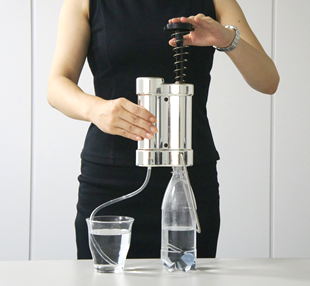 It is an inspection result as to what will happen if the water purifier is used to purify highly concentrated contaminated water above the reference value. It is not guaranteed. Q. Is the inspection result of radioactive substance removal official? A. Currently, there is no inspection standard specified by the country. So, we can not announce public inspection results. But, we can do it by ourselves as a third party organization to obtain inspection results before and after purification with our handled products.